These Mountain Nomenclature cards are formatted in a 3-part card series with black-line master included. 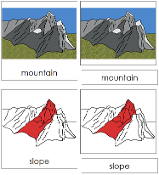 The 6 parts of a mountain are: mountain, base, slope, ridge, face, and peak. The mountain is in color, the individual parts are all shown in red.